Eco-friendly packaging options are a rising trend in the industrial packaging market. While low- cost packaging continues to offer the largest scope for market players, eco-friendly packaging is creating new opportunities for growth. The end-use industries in the industrial packaging market are label and packaging products, construction, automotive, and service industries. Growing regulations regarding waste management and recycling are expected to drive more innovation and new opportunities for all players in the industrial packaging market. 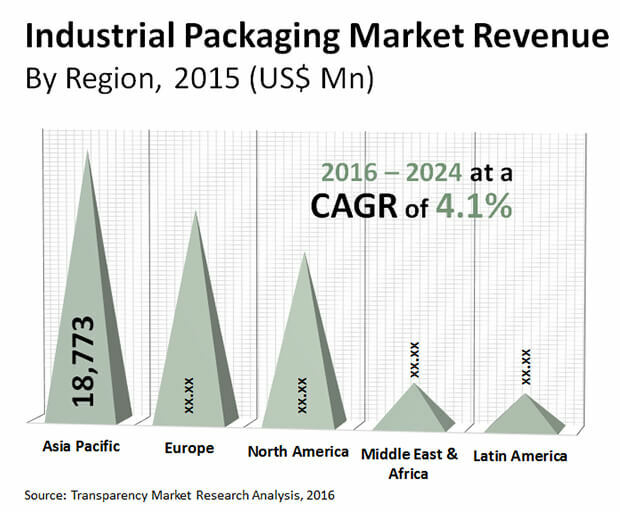 According to TMR report, the global industrial packaging market is expected to grow at 4.1% CAGR during 2016-2024. On the basis of its steady growth in CAGR, the market will reach US$73.25 billion by the end of 2024. This is a considerable growth as the market stood at US$53.03 billion in 2016. Among its product segment, the intermediate bulk container is expected to drive major growth for the industrial packaging market. Growing development in manufacturing in Asia Pacific is expected to result in robust growth for the region during the forecast period. The electronics and pharmaceutical sector are experiencing a growing demand for products, thanks to innovative products and end-applications. The electronics sector witnessing the rise of wearable technologies, continuous improvements in popular smartphone technology, and never-before applications like smart speakers. These applications are expected to play a key role in futuristic developments such as AI-driven customer interactions and automation. Similarly, the pharmaceutical industry is witnessing expiry of various patents recently. Additionally, the established player in the sector are also competing against rising influx of generic drug manufacturers. This coupled with growing cost-effective trends such as outsourcing are fuelling innovation in the sector. Additionally, various illnesses like diabetes and cancer are on the rise globally. Hence, vital application of packaging and rising demand are expected to create significant opportunities in the industrial packaging market in the near future. The industrial packaging market is divided into main regions of the globe including North America, Europe, Asia Pacific, Latin America, Middle East & Africa. The industrial packaging market is expected to witness significant growth in the North America region. The region is losing its earlier advantage in manufacturing to Asia Pacific. However, US continues to be a power-house for manufacturing in the world. Technological advancements in industrial packaging techniques and automation driving the growth of manufacturing in the region is a positive sign for the market growth. Asia Pacific is expected to register significant growth, thanks to the rise of manufacturing in various countries such as Vietnam, India, China, etc. The industrial packaging in this region continues to grow due to large base of local players and growing demand for electronics and automobiles.